KTR Promotions in Venice Beach & Los Angeles California: Sunday, June 26, the Art or Eva Montealegre Set to Show at Upper West! Sunday, June 26, the Art or Eva Montealegre Set to Show at Upper West! 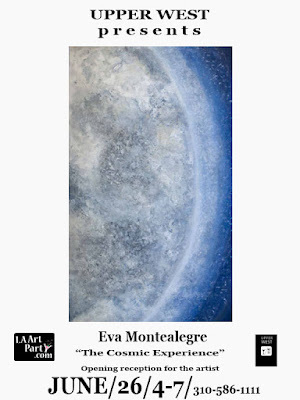 Upper West Restaurant presents “The Cosmic Experience” featuring the art of Eva Montealegre on Sunday, June 26 from 4-7pm. The Santa Monica restaurant features new art from local artists every few months. As is the tradition, Upper West hosts an artist reception and a meet and greet with each new artist. Curated by the restaurant and the team at LAArtParty.com, talented artists are selected for a solo exhibition and celebrated at Upper West. The work of artist Eva Montealegre is set to be featured on Sunday, June 26th with an opening reception taking place from 4:00pm to 7:00pm. Montealegre has shown in galleries across the U.S. In addition to being an artist, Eva is a crime novelist writing under the name, Eva Batonne. Eva’s first novel is titled Resurrection Diva, and has only garnered rave reviews including a blurb by Michael Connelly. It’s available on Amazon and you can visit her crime fiction website @ www.evabatonne.com for more insights. Her next novel is due out late this summer. Eva has been known to work in various forms of art, including writing, filmmaking, singing, dancing and acting, too. She has taught mask and headpiece workshops that often include original writing, music & performance as well as the construction of powerful healing masks that maybe hung on the wall to decorate a home or office. Montealegre explains a bit about what she will be showing…“I have several paintings from the Deep series: Deep One is the largest at 44” x 70” and all of these are abstract and they have to do with our deeper selves and the meanings that are sometimes elusive and yet so present. The idea is to invite the viewer to imagine going deep into the ocean of their beings or even to propel themselves deep into the outer space of their existence in a sort of self-exploration. We are all in relationship with the cosmos even though we don’t think about it much. Where does that experience begin? At the tip of our nose. 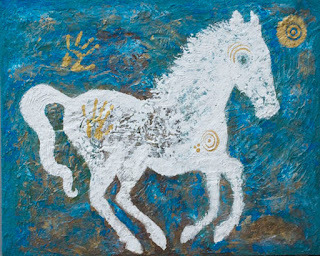 Spirit Horse is about staying connected to one's youthfulness and playfulness. It's about unbridled energy and sensuality and personal power. It is a delightful expression of a joyful oneness with life. All the gold symbols are very happy, sunny and healing type symbols. 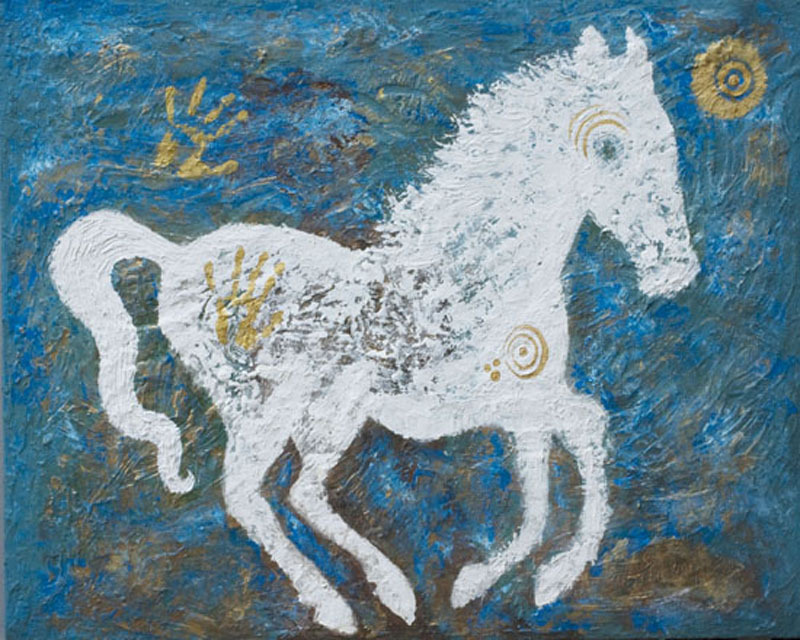 Both Spirit Horse and Bear Spirit and many of my paintings resonate with mankind's cave paintings which are all over the planet. Upper West is known for its incredible cuisine, provided by Chef Nick Shipp who hails from Fort Worth, Texas. Adding his own special flair, Shipp has been cooking since he was just fifteen and graduated from the Culinary Institute of Dallas.